If you are in Coimbra or happen to be passing by, you should not miss out on the opportunity to visit the Physics Museum at the University to admire the remarkable collection of eighteenth century instruments on exhibition. This is the group of machines which outlived the Royal Cabinet of Physics, “the best in Europe, better than that of Pádua, which has only 400 machines, while ours hosts 500”, as the Marquis of Pombal proudly boasted in a letter directed to the head of the university. From the mid-sixteenth century to the mid-eighteenth century, a time span of more than 200 years, education in Portugal was almost entirely in the hands of the Jesuits. Members of the Society of Jesus exerted a direct influence on both elementary and intermediate studies (what we now call primary and secondary education). They had a direct impact, too, on university education, dominating the University of Évora but having a rather moderate influence on the University of Coimbra. The members of this religious order were cultured men who played an important role in spreading culture and science. At the start of the seventeenth century, they kept pace with the astronomical progress of Galileo and even supported the discoveries of the Phases of Venus and Jupiter’s moons, which they reinforced with independent observations. Christopher Clavius (1538-1612), a member of the Jesuit Order and close friend of Galileo, and perhaps even the most important cosmographer at the time, developed the nonius of Pedro Nunes, making way for the modern Vernier. Clavius was also responsible for the reform of the calendar, ending a period of confusion which had dragged on for many centuries. The Jesuits also played a vital role in spreading western mathematics and astronomy to the East. However, almost half way through the eighteenth century, the Jesuits’ tenacity to the culture of the past grew, as they opposed themselves to the extraordinary discoveries of the preceding century. In 1746, the Jesuit priest José Veloso, rector of the Colégio das Artes in Coimbra, issued a proclamation forbidding reference to any “new ideas, poorly accepted or useless for the study of the higher Sciences, such as those of Renato Descartes, Gassendi, Newton, and others”. In the same proclamation, he prohibited “any conclusion whatsoever opposing the system of Aristotle”, making it quite clear that the Jesuits were officially opposed to the progress of scientific thought. This opposition, which emanated from within the heart of the Society of Jesus, was not acclaimed by everyone in the Society and had a reduced influence on the teaching policy of this religious order. Rómulo de Carvalho, the great specialist in our scientific history of the eighteenth century, states that the Society of Jesus was striving “to preserve the Aristotelian statute”, “preventing any scientific progress, with all that this implied”. Outside the bastion of the Society of Jesus, “society had been radically transformed and the climate was becoming steadily less receptive to Jesuit indoctrination”. The conflict exploded in 1759 with the expulsion of the Jesuits from the entire Portuguese territory. The nation’s education system suffered almost total collapse, as all of a sudden there was an enormous shortage of teaching staff. The Marquis of Pombal decided to radically reform teaching. Part of this reform included the creation of the Gabinete de Física Experimental as a “Deposit for Machines, Devices and Instruments”, or laboratory equipped with all the didactic apparatus needed for the experimental component of the subject. The idea was to teach “the truths known up to the present moment, as opposed to the theory of Aristotle, and to create “Explorers of Nature”. The experimental physics demonstrations were very well received by the nobles, who considered them as an authentic form of entertainment put on by the physicists. The monarch himself appeared frequently at these sessions, which very often were a true form of public diversion, in keeping with what went on in other European countries. 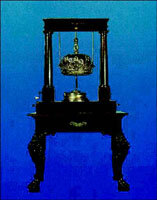 As time went by, the instruments were centralised by the Real Gabinete de Física of the University of Coimbra, where they were used for educational demonstrations and experiments. A catalogue of that period still exists today, with a detailed description of the “Machines” and their functions. The years went by and what were highly useful innovative experiments and pedagogical materials fell into disuse. In the mid-twentieth century, professor Mário Silva, who was among the first to introduce relativist mechanics and modern physics in Portugal, started restoring these instruments. More recently, with the preparation of the Europália exhibition, the valuable estate of the Real Gabinete de Física was recovered, catalogued and exhibited to the public. This material is on display today in the Pombaline building of the original Cabinet of Instrumental Physics, at the University of Coimbra. 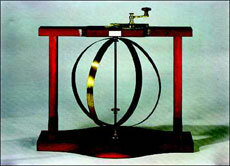 The museum officials decided to keep up with modern times by publishing a webpage displaying the existing instruments, along with an explanation of how they work. The most interesting aspect of this virtual museum, and which surpasses the exhibition itself, is the animation of the instruments and the exhibition of short films reproducing the experiments for which they were designed. As can be expected, most of the instruments are in a very precarious state and their continued use would rapidly lead to their destruction. The exhibition is therefore static and the instruments may only be viewed from a certain distance. Visitors therefore have to imagine the experiments for which they were designed. 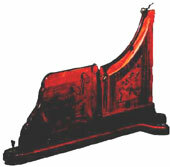 The exhibition of films in which the movement of the instruments can be observed makes it possible the public to relive experimental scenes with the distinct flavour of a remote past. A visit to the magnificent Physics Museum of the University of Coimbra is a must. Yet today, 300 years after the birth of the Marquis of Pombal, the Internet celebrates the innovative spirit of his educational reform with a virtual museum that is accessible anywhere in the world. The exhibition catalogue of the Physics Museum of the University of Coimbra presents magnificent photographs and descriptions of the objects on display and is complemented with various historic and didactic texts of great interest, such as a document written in 1963 by Professor Mário Silva, the person responsible for restoring the pieces of the museum, and a text by Rómulo de Carvalho, which places the museum within the framework of the Pombaline reform of university education. The Museum is located in the Largo Marquês de Pombal, very close to the centre of the university, and is open to the public from Monday to Friday, from 14h30 to 17h30. For a virtual visit to the museum, visit their webpage. 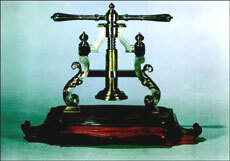 ”This device is a model of a press made of iron and brass set up on a wooden base. It was designed to compress lead pellets filled with water. The water was introduced into the ball through a hole, which was then sealed with a screw cap. When the handle of the press was cranked on its vertical axis, the piston moved down, compressing the lead pellet, which became slightly deformed. If the pressure of the piston against the lead pellet was intensified, tiny drops of water started appearing on the outside, without the deformity of the pellet being accentuated. This result made it possible to witness the incompressibility of fluids, simultaneously demonstrating the porosity of lead”.